The announcement came from Anchor team member Nir on a Monday, June 26. By Wednesday, June 28, Anchor 1.0 would be no more. The original beacon of collective voices would disappear into a vortex, like an old TV with a bad vacuum tube. 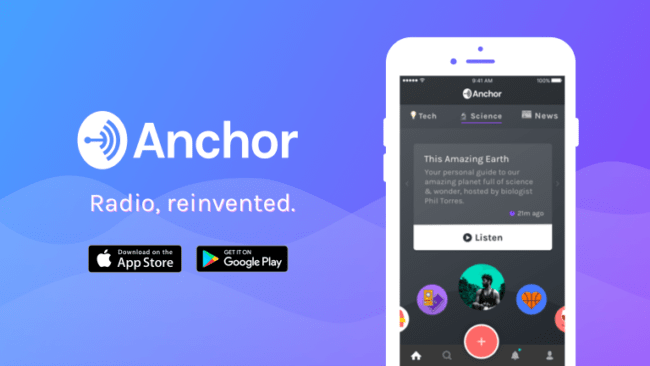 Founded in 2015 from a tiny apartment in New York City, Anchor is a radio app that allows users to create stations and post audio content. There were two versions for a time, Anchor 1.0 and Anchor 2.5.2, until the team decided 1.0 had outlived its usefulness. For a segment of the Anchor community, Nir’s announcement functioned like a funeral elegy. So, in its final hours, a handful of the app’s OGs gathered on 1.0 for a virtual wake-keeping and libation pouring, decrying their devotion to the space that had provided entertainment and solace. Barbara Kolbe Baker, a Cincinnati-based marketing strategist, noted a number of reasons for her love of the first version. She also noted a voyeuristic reason for remaining on 1.0 — to observe its demise. The remaining ‘renegades’ on Anchor 1.0 was its lifeline, some refusing to transition to other apps despite the state of limbo. The uncertainty is what troubled tech consultant Avie Uniglicht. He feels that a lack of communication from Anchor developers led to misunderstanding from the users. At the same time, Uniglicht recognizes that Anchor is, at its core, a business. “As a tech guy I understand the process. I’m fine with Version 2, but was not fine with their communication style [about it],” said Uniglicht. For Kevin Williams in Los Angeles, the engagement and connections are what made 1.0 endearing. It’s reasonable that social media users would experience a sense of loss when an app goes kaput, similar to losing a friend. This may come from the perception that the connections made through the app will also fizzle. Retired professor, psychotherapist and relationship coach Dr. Debra Nixon affirms this, citing the human need for interaction. There’s also another aspect – the fact that change is difficult. As an avid “waver”, I hadn’t thought much the demise of 1.0, but I did feel nostalgic listening to audio threads that recalled good times as the final hours crept closer. This is not the first social app to pivot, and will not be the last. It’s not about the platform, it’s about the people. See you on Anchor 2.5.2. This post was written by Dr. Chetachi A. Egwu, Communication Faculty at University of Maryland University College. Her scholarship focuses on media, tech and pop culture and the African image in film, with an emphasis on documentary. The Howard University alumna is the host of the livestreamed show MediaScope, co-host of the podcast TV Channeling and owner of Conscious Thought Media. Follow her on Twitter @Tachiada.